Water inside the brain moves in unusual ways, causing changes to white matter. Plenty of studies have examined health risks associated with space travel: elevated risks of cancer, nasty radiation, and loss of bone density. To make things worse, travelling through space at zero gravity for prolonged periods might damage astronauts’ brains: a new study in the journal JAMA Neurology found that spaceflight was associated with changes in white matter — nerve fiber tissues of the brain responsible for learning and other important functions. The researchers examined MRI scans of 15 astronauts who had spent up to 200 days at the International Space Station, before and after the missions. We already knew that in zero gravity, the water surrounding the brain redistributes, causing the brain to shift upwards within the skull. But as the new research found, this phenomenon seems to cause white matter to age faster. “White matter changes were of a greater magnitude than those typically seen during the same period with healthy aging,” reads the paper. Even more worrisome: the effect becomes more pronounced the longer you spend in space. “[The changes] were greater with longer spaceflight mission durations, and larger brain changes were correlated with greater balance declines,” co-author and professor of applied physiology and kinesiology at the University of Florida Rachel Seidler told Popular Science. But it’s not all bad. 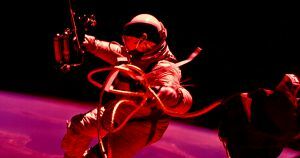 The effect was significantly reduced in astronauts who had been in space before, suggesting the body can adapt to microgravity. Still, it’s a serious enough issue that it warrants further research. After all, the longest consecutive spaceflight was a mere 342 days — just under a year. That means Seidler and her team still have the bulk of the work ahead of them. “The consequences of these brain changes are unknown at this point,” said Seidler.